Bolivia, Nicaragua and Venezuela have officially offered asylum to former CIA contractor and National Security Agency whistle-blower Edward Snowden. Snowden, considered a wanted fugitive by Washington for leaking classified intelligence reports to the media, has been restricted to the transit area of Moscow’s Sheremetyevo Airport since his arrival on a flight from Hong Kong on June 23. “I just want to say to the Europeans and Americans: we are going to give asylum if that American [Snowden] who is haunted by his countrymen asks us for it. 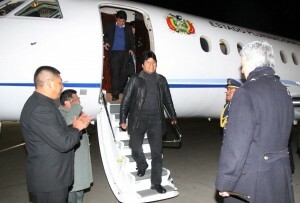 We have no fear,” Bolivian president Evo Morales told the media Saturday. Morales’s decision came two days after his plane was abruptly rerouted to Vienna after being denied permission to fly over France on suspicion Snowden was on board. A search of the plane turned up nothing. A host of South American nations including Brazil have supported Morales in expressing outrage at the rerouting of his plane. There was speculation last week that Snowden, who had made more than 20 requests for asylum, could stay in Russia. Russian President Vladimir Putin told the media last week that Snowden could stay in Russia provided he “stop his work directed at hurting our American partners”. “In the name of America’s dignity … I have decided to offer humanitarian asylum to Edward Snowden,” Maduro said during a military parade marking Venezuela’s independence day, Reuters reported. Well, we now know which countries have a backbone against the pathetic bought off whores of the world. I say thank you to these countries and God bless them and their people.